Kyoko Hosono, born in Toyama on the west coast of Japan, took her first piano class at the age of five. One year later, she had already won 1st prize at the Fukui Piano Competition in Toyama. In 1989, she transferred to the renowned Toho School of Music in Tokyo. She began her studies in piano at the University of Arts in Berlin under the tutelage of Prof. Erich Andreas, and finished at the Academy of Music „Hanns Eisler“ under Georg Sava, where she scored top marks in her concert exam (Konzertexamen). Kyoko Hosono is a former recipient of the Beethoven Prize for Chamber Music with cello, which was presented to her at the 15th Concorso Internazionale in Caltanissetta, Italy. She performs regularly as a solo artist with various orchestras, including the Berliner Symphoniker as a fellow of the Gotthard- Schierse-Stiftung (concert at the Berlin Museum of Musical Instruments) and as part of several tours of Japan. She also gives piano recitals for instance at the Skagen Music Festival in Denmark. She dedicates much of her time to chamber music. Since many years, she performs in a duo with violoncellist Nikolaus Römisch (Berliner Philharmoniker) in Japan and Germany (2001/2004). She has appeared on stage in further chamber music constellations with musicians from the Berlin Philharmonic Orchestra and the orchestra of the Staatsoper „Unter den Linden“. 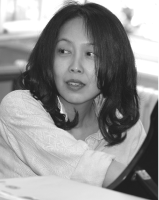 In addition to her work with the three-piano ensemble Xinowa Sej, she also composes and writes songs that she performs herself.